Suitable for 3 - 4 people, or 2 people who are having friends around for dinner at the weekend! 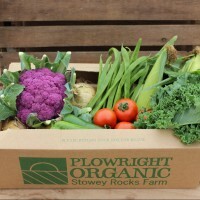 Our large 'fewer roots' veg box contains 9 or 10 different vegetables: one root veg (never potatoes) and more greens and salad items than our standard large veg box. Produce varies weekly and according to the seasons to give you a good variety.